The following note was published by Ferenc Almássy, the Editor-in-Chief of the Visegrád Post, a site specializing in news from Central Europe from a Rightist perspective, today in response to Steve Bannon’s lecture at “The Future of Europe” conference in Budapest yesterday. I knew Bannon wasn’t going to change my life by presenting revolutionary ideas and concepts, nor that he would offer some new paradigm for the development and strengthening of Central Europe. But at least I expected him to offer a strong speech which would shed light on the Trump administration’s view of Central Europe. I hoped that he would explain the strategic plans the United States has in mind for its Central European allies. I expected him to speak about American/Central European/Russian relations. But none of this happened. All we got were things that are nothing new for anyone who is following his work or who followed the last American presidential campaign. Of course, Steve Bannon is smart, speaks clearly and in well-formulated English, and is most definitely a pleasant orator to listen to. But at such an event, far more was expected from him, especially given the context, such as the Central European revolt against the Brussels elites; the ongoing tensions between the US and Russia, with Europe between them; Trump’s pledging of support to the Three Seas Initiative last July; and of course the recent reelection of Viktor Orbán, “who was Trump before Trump,” according to Bannon’s own words. Well, I was disappointed, but not really surprised. The former “Eastern bloc” is neglected in the West, for some understandable reasons. This has in part to do with its continuing inferiority complex in relation to the West, which causes its intellectual elites to applaud anything Bannon might say, even if it is against Central European interests. It might be a strategic mistake for them to feel this way, but that’s the reality of the situation. It was at this point that I lost all vestige of interest in what Bannon was saying. For some reason, he is pushing this militaristic agenda for the interests of the United States. Let’s be clear: I do not blame him, he is an American patriot, and is working quite obviously for American interests. Good. The problem was that this conference was about “the future of Europe,” and as a Central European, I strongly believe that our interest is in not following any warmongering foreign policy. Steve Bannon appeared to me to be unprepared for this conference, or at least unable to bring something new or interesting for Central Europeans, and last but not least, he was pushing a warmongering, US-centered agenda. It was a disappointment, but also for me, it inspired a need for defiance. 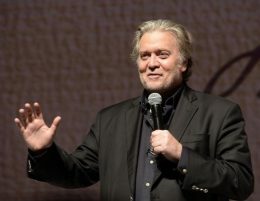 Published: May 24, 2018 | This entry was posted in North American New Right and tagged articles, Central Europe, North American New Right, reprints, Steve Bannon, The Future of Europe conference, Visegrád Post. Both comments and trackbacks are currently closed. Visegrad Post: I remember last fall when Bannon departed the White House, he made some speech and I cannot remember to whom/where it was given. It might have been Breitbart or affiliated with Breitbart since he went directly back to them. I found it on YouTube at the time but cannot find it any longer. I too, like yourself, thought he was going to give some inspiring (to White nationalists) word/speech. But I was horribly disappointed and have given up completely on him, just on this one speaking engagement. He said bluntly that he was in favor of a nation that is not based on race or ethnicity. If one is good for the economics he wants them in his country. The words I just used describe the idea he espoused. Not the exact words, but very close to his own words. I guess I shouldn’t have been so surprised considering that Breitbart was a jew. You were taken in by Breitbart’s propaganda for more than aa few seconds? It was easy to see, just right zioneocon with a few frills and some colllabotrators who produce the occasional almost entertaining sentence (although on behalf of you USA people, I think Coulter is a little on your side re. Invasion of you). Another thing that would be easy to write ten to thirty thousand words of analysis about, if you did it as a thesis or major essay, be very careful to note the assessors. I never gave much thought to the Breitbart site until I looked into them because of all the talk about Bannon when he teamed up with Trump. But when I saw that Breitbart was a jew, I did indeed wonder. And that site definitely turned out to be a neocon (Zion) shill/rag. I haven’t been redpilled for very long, so sometimes I’m a little late at picking up on things. Not sure what you mean in regard to Coulter and essays. Coulter seems outright anti-3rd world entry into America. Not just illegal, but legal as well. In interviews and those books she has written she seems to understand that 3rd worlders do the same destructive things whether they are here legally or illegally. So, no 3rd world entry under any circumstances. And I agree with that wholeheartedly. Of course Bannon is wrong on Iran. He made similar comments on BBC Newsnight last night. Israel is Iran’s deadly foe and I guess Bannon knows that to be anti-Israel is tantamount to political suicide in present-day America, hence he plays it safe. It is called political realism. Don’t really understand Bannon’s hawkishness towards China at all. I guess it kind of makes sense as a ploy to take the heat off Russia without seeming weak but I still don’t like it. The United States should have friendly relations with all countries. Because China is an imperialistic utterly hostile foreign power. PRC believes they are gonna hail in a socialist utopia and don’t think for a second they are not deliberately using the mass immigratjon of Chinese into Canada and Australia as a way to infiltrate and control those countries. I can’t stand Bannon, but China is the only country I can agree with him on. What is even worse is the Chinese have no problem pushing globalism for everyone else and nationalism for itself. Sound familiar? Yes. China sees itself as assuming the leadership of globalization, if the USA is not up to the task. It’s still globalization, and it still involves plutocrats. For example there is the usual nexus between Western and Chinese plutocrats in the development of the New Silk Road, just as Western businesses have always had a good deal out of the Chinese occupation of Tibet. China is an example of the ‘enemy of my enemy NOT being my friend’, even if it can be said that the alleged antagonism between the USA and China is anything other than low level shadow boxing, while it’s business as usual behind the scenes. I strongly doubt the ‘always’, too. So you are implying that it was so from the initial occupation. Thank you for the info., Kerry. I note that all of the links are quite old, but will look at the content. The titles also use ‘Tibet’ in a strange way, it seems to mean ‘occupation govt. of Tibet’, or similar. Tibet is a strange case in both geopolitical and cultural terms. The CPC line on the pre-invasion society is not without point, it was the darkest variant of Buddhism, and people were enslaved, the tales of drums with human skin for the beating surface, cruel acts on living people, etc., are true, not propaganda, unlike talk of lampshades much further west. That is why western occultists find Tibetan Buddhism so fascinating. This is not to excuse the invasion, I think it is terrible for the people of Tibet. The leader of Aum Shinrikyo, ‘Asahara’, once had an audience with the Dalai Lama. The latter’s opinion was ‘I like him, he runs a tight ship’. This was not long before the initial nerve-gas attack by Aum. I look at old photographs, and in the case of the Dalai Lama, short movies, the similarity of visual style between him and Aisin Goro Pu Yi (last Manchu emperor of China) is striking. The UK made Tibet a kind of protectorate, but of course dumped the place when push came to shove. Although it was still policy until at least ten years ago, it is one of many things their (UK) political, bureaucratic, and legislative gangs now prefer to pretend never existed. Anyway, only a fool would think that the UK police state is any (not ‘much’, ‘any’) better than the CPC’s. Sure, much sympathy for Tibetans being deprived of their ancestral homeland,. .
Riki rei on counter currents has good articles on China. Bolton also has articles on his blog. Xyz Dingoes also has podcasts talking about China’s negative influence.